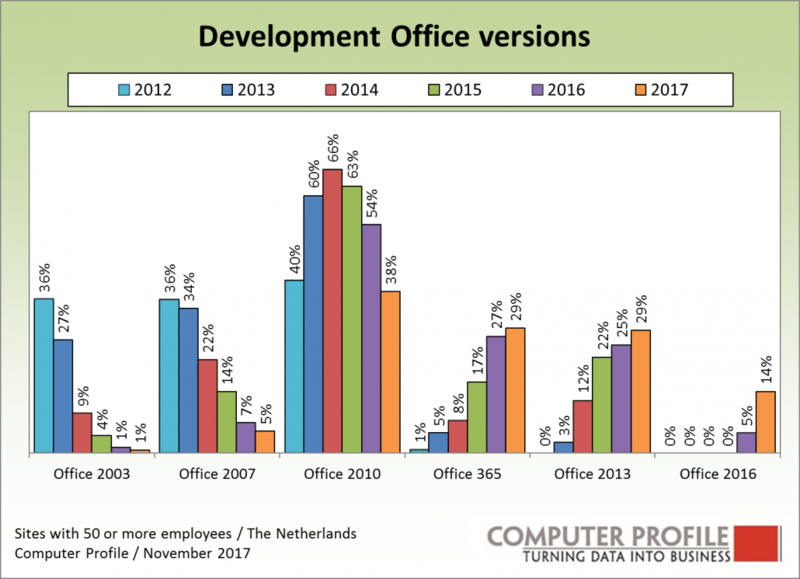 Few subjects are dominated by Microsoft as strongly as the market for Office applications, where Microsoft is primarily its own competitor with the different versions released in recent years. At present, we see that three versions are still registering growing use, while a fourth version is still the most prevalent. The most prevalent variant is Office 2010. Seven years after it was introduced, this package is still in use by 38% of Dutch business sites with 50 or more employees. It is however being replaced at a rapid rate. In 2016, more than half of the sites indicated that they used Office 2010. Office 365, which appeared in mid-2011, is used in ca. 29% of the sites. We see Office 2013 in a larger group, namely, 29% of the sites. Office 2016 has in the meantime been on the market for two years. At present, we see this version in use in nearly one out of seven sites. We usually see that sites of smaller companies in particular are at the vanguard of adapting new Office application solutions, and this is confirmed again. Office 2016 is in use in ca. 16% of sites with 50 to 100 employees, while use in higher categories is a little lower with every step. Only a small 5% of 1000+ sites indicate that they use Office 2016 at present. Growth for Office packages is in the coming years expected from Office 2016 implementations or Office 365 licences. Most of these will be at the expense of the current Office 2010 installations. That is why the use of these three versions is still indicated by activity, where it is immediately striking that very many sites in government, healthcare and construction still use the 7-year old Office 2010 version. Office 365 is most widely used in educational institutions. The differences for Office 2016 compared with the other segments are relatively limited. Industry and education seem to be at the vanguard in acceptance here. A remarkable phenomenon is perceptible for operating systems on PCs in the business market. You could call it the “skip 1 rule.” Windows XP was a very popular system very long after it was introduced. Vista, on the other hand, never gained traction on the business market. Windows 7 (introduced in the late summer of 2009) is currently the most prevalent business operating system. Nearly two thirds of the business sites indicate that they use it for PCs. As such, the decline in penetration is acquiring clear form. In 2016, Windows 7 was still in use in 86% of the sites, whereas that figure was 90% in 2015. Windows 8 shows the same flaw as Vista. It never managed to get out of the shadow of its predecessor. The highest penetration that we saw for this platform was 27%, in 2015. If we apply the “skip 1 rule” again, then Windows 10 is once again a success in the Microsoft portfolio. This seems to be the case two years after it was launched. In 2016, more than a quarter of the sites indicated that their PCs ran on Windows 10. In 2017, that rose to more than half of all interviewed sites. The highest level of use for Windows 7 was noted 6 years after it was launched. This would suggest that the penetration of Windows 10 would continue to increase until 2021. The rule that the initial use is higher in smaller companies than in the large-scale market applies also for operating systems. 56% of sites with 50 to 100 employees use Windows 10, 60% of sites with 100 to 200 employees, and ca. 45% of sites with 500 to 1000 employees, whilest one third of sites with more than 1,000 employees indicated that they run Windows 10 systems. 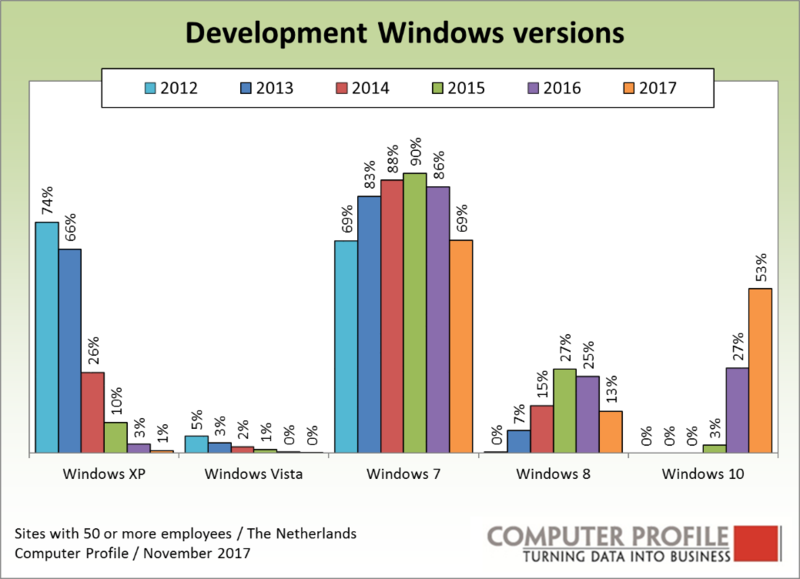 The use of Windows 7 by number of workers shows the opposite variant. 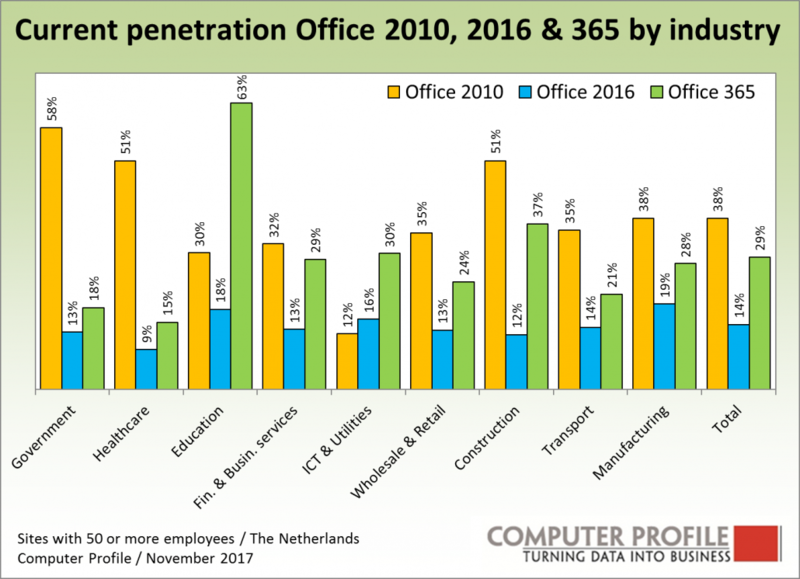 The current rate of penetration is the lowest among sites with 50 to 100 employees (62%), and the highest among sites with more than 1,000 employees (78%). The use of the two most prevalent systems, Windows 7 and Windows 10, is also split by branches. It turns out that apart from one segment, ICT & Utilities, Windows 7 is the most prevalent system in all segments. 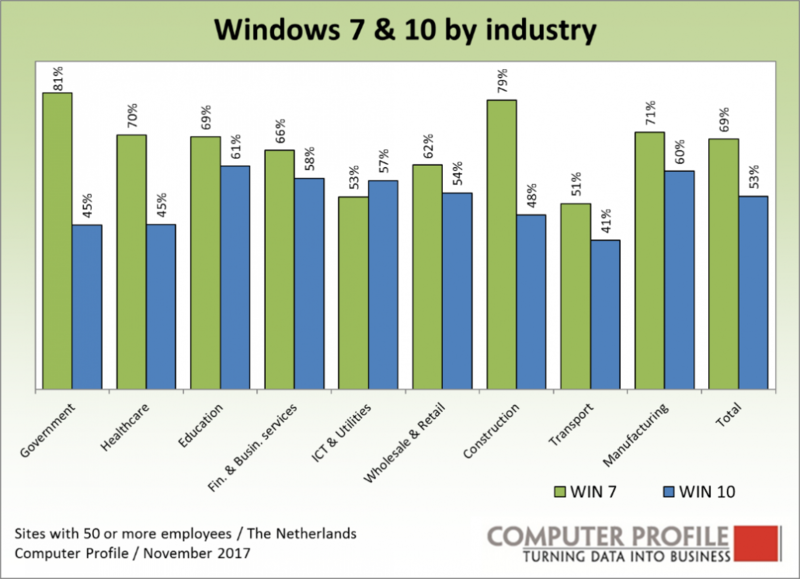 The not-for-profit sector and production sectors in particular use Windows 7 above average. Windows 10 has the highest penetration in education, industry and ICT & Utilities. Microsoft itself indicates that Windows 10 is the last operating system. The way updates are carried out, including name change, accompanied by extensive marketing activities, will apparently change. Presumably, a strategy comparable with Linux distributions and Apple OS will be adopted. Windows 10 will continue to be called as such, with the necessary improvements through periodic updates.